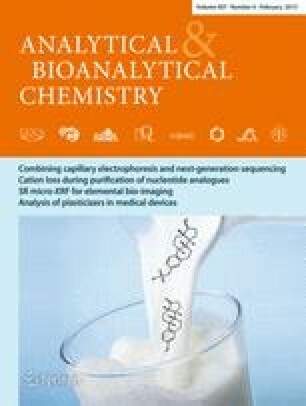 Analyses of four endocrine disrupting chemicals (EDCs) in water and milk samples were undertaken by using magnetic molecularly imprinted polymers (MMIPs). These were prepared via the surface molecular imprinting technique using super paramagnetic core-shell nanoparticle as support. Diethylstilbestrol (DES), which is a typical EDC, was employed as the template molecule. The obtained MMIPs were characterized using transmission electron microscope, Fourier transform infrared, X-ray diffraction, and vibrating sample magnetometer. Accordingly, the adsorption capacity and selectivity of prepared MMIPs were investigated. The binding isotherms were obtained for DES and fitted by the Freundlich isotherm model. A corresponding analytical method to determine four EDCs was developed. The recoveries of the spiked samples in pond water and pure milk range from 67.8 to 93.2 % and from 65.3 to 92.5 %, respectively. Coupled with high-performance liquid chromatography analysis, the prepared MMIPs were successfully applied to the analysis of EDCs in water and milk samples. The online version of this article (doi: 10.1007/s00216-014-8425-0) contains supplementary material, which is available to authorized users. This work was financially supported by National Natural Science Foundation of China (81227802), the China Postdoctoral Science Foundation (2014 M550501), and the Fundamental Research Funds for the Central Universities (xjj2014066).